This is the crew who was found down on the Guadalupe River on the Rio Raft river front flogging the water with spey rods. Under the tutelage of instructor Jay Clark, these spey casting workshop students learned to manage the winds and currents on the river using the Switch Cast, Double Spey, Snap C, Snake Roll and Single Spey. Once these skills were "mastered" on the right river, we waded across to the other side and learned to do them backwards. If that wasn't enough to challenge everyone, the Spey rods were switched for our single-handed rods and we learned that everything we learned could be done with a regular 9' rod. Jay also taught us lots of stuff about rod and line selection. For those folks who didn't have their own rods, reels and lines, Rajeff Sports provided the class with an assortment of Echo spey rods and Airflo lines. 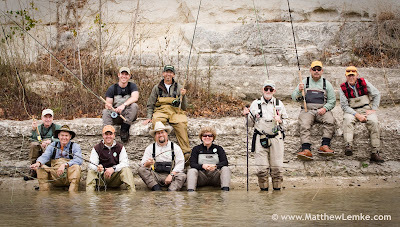 I hope that we'll see some spey casters on the Texas rivers. I personally can see using mine on the Llano River. A special thanks to Jay Clark for his excellent instruction and Harry Crofton for the great catering job.